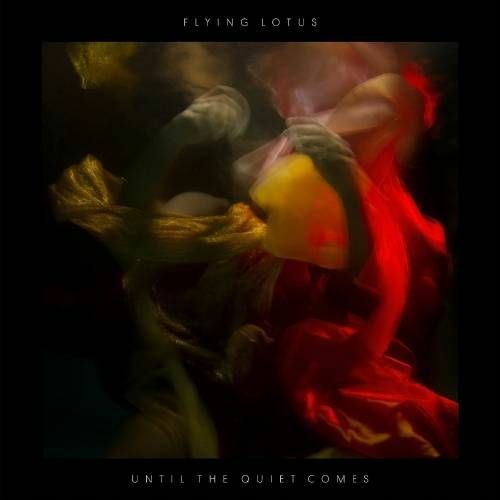 Flying Lotus albums take multiple listens to reveal themselves because they’re such densely layered opuses of electronic and organic sounds, voiceless, beat-driven pieces and guest vocal work that usually draws Flying Lotus into more accessible territory. So after many spins, I can say Until the Quiet Comes is yet another excellent entry into Fly Lo’s canon of work, which has included the murky Los Angeles and its excellent follow-up, Cosmogramma. Until the Quiet Comes, appropriately enough, is a more chilled out affair. The first vocal track we hear, “Getting There” with Niki Randa, doesn’t break the more atmospheric bent of the album’s first half, though Randa’s gentle vocals tug you into the density of subsequent tracks like “Heave(n),” which starts lush and laid-back before layering beat over beat until your mind spills over trying to keep track of the thing. It’s difficult not to talk about Flying Lotus albums in terms of vocal and more pop-oriented tracks, as the rest swirls together in a delectable stew, so you’ll probably track back to songs like “Sultan’s Request,” with its fat oscillator and dubsteppy beat taking center stage; the sparkling “The Nightcaller,” with its digitized handclaps and fizzy, funky synths; or the Erykah Badu-starring “See Thru to U,” in which Badu’s warbly pipes guide listeners through a kind of grimy afrobeat-jazz fusion that defies easy categorization. Speaking of Badu, Thom Yorke’s vocals on “Electric Candyman” sound more like her than anything he’s done with Radiohead — listen to this dusty bit of electronic jazz to hear Yorke in completely new environs. While Until the Quiet Comes ain’t exactly party jam material, it’s a brave journey into new ways of producing sound and song that takes time to sink its teeth in but offers lasting rewards.